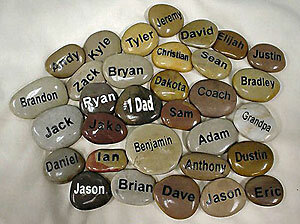 Custom Engraved Stones, Engraved Pocket Stones, Engraved Personalized Stones, Stones & Crystal engraving. Engraved Logos-Names, Engraved Personalized Garden Stones, Engraved Pet Memorials, Engraved Wedding-Bridal Favors, Engraved Corporate Promotional Stones. Engraved Stone Discounts begin at 4 pcs plus. We offer custom engraved stones and stone engraving, engraved stones with company logos, engraved pocket stones, stone jewelry, diamond crystal paperweights, engraved pet memorials and garden rocks that make unique personalized gifts, engraved wedding favors & bridal gifts, and engraved corporate promotional or inspirational stones. 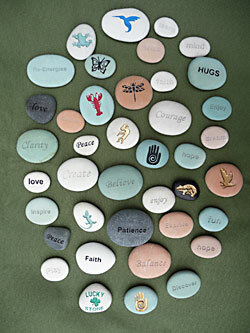 Engraved stones with inspirational words or phrases tells that special person you care, encourages or motivated them. Engraved stones with animal images, boys names & girls names & family names placed on semi-precious gem stones, natural river stones, & polished river stones in earthtone desert colored stones. Call us for wholesale prices on hand engraved stones and engraved natural river stones - available in engraved stone colors of gray, white, pastel green, pastel peach, black or a mix of all colors in any size that you desire. You may choose polished or unpolished natural River stones or semi- precious engraved stones in bright colors depending upon the stone type. Polished River Stones are available in earthtone desert stone colors of black, white, red/rust, yellow, tan, brown, gray and an array of different shades. These exciting engraved stones are used for bridal favors, wedding party gifts, reception place card holders and other party favor ideas for your special event or favorite celebration. Just about any stone product that we offer can be engraved or personalized. Custom stone engraving with sand blasting techniques are our specialty. We provide DOUBLE SIDE engraving as well as SINGLE SIDE engraving. For the home or office, for promotional giveaways and corporate promotional items we offer personalized Business Card Holders or other engraved stone products in each of the stone colors mentioned above. 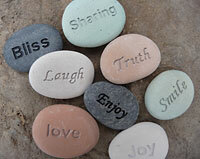 Join our world of engraved rocks and engraved stones and have fun along with us. If you will send us your ideas, we will provide a quote promptly. Call Jennifer at 973-948-0085 for personalized service and easiest way to order. 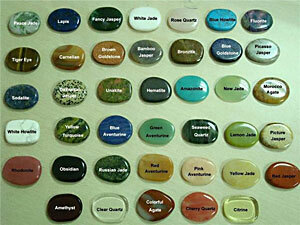 1) StoneWords products are real engraved stones and crystals. 2) A human being will answer the telephone as often as possible. Telephone calls will be returned. Emails will be answered immediately. Our attitude will be pleasant, helpful and considerate to all. The BEST PRICING will be obtained with a telephone call as opposed to utilizing a shopping cart. 5) S&H is the actual freight charge with no markup. Fed Ex Ground or US Mail is our normal mode based upon weight of order. 12) StoneWords will drop-ship to your customers and apply your return address sticker to the package. This is a unique opportunity to make money selling engraved stones and engraved rocks without any investment using our large inventory of over 100,000 pieces. To participate in this endeavor simply register with us via email or telephone.